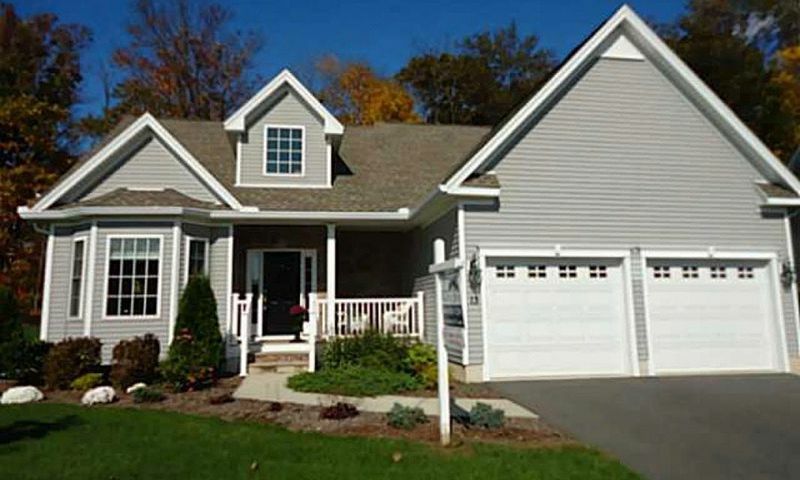 Beckley Farms in Berlin, Connecticut is a quaint 55+ community. Started in 2010, plans call for 170 low-maintenance single-family homes. Situated near Hartford, Connecticut, the surrounding area provides a myriad of choices for shopping, dining, and entertainment. This charming neighborhood boasts an excellent low-maintenance lifestyle perfect for active adults. Although there is no clubhouse at this time, plans call for one to be built in the future. Once constructed, the proposed clubhouse will have a fitness center, multi-purpose room and catering kitchen. Beckley Farms is surrounded with beautiful walking and biking trails as well as natural open space where residents enjoy the outdoor fresh air. Construction of Beckley Farms began in 2010. This 55+ community will consist of 170 single-family homes upon completion. Homebuyers can choose between three floor plans ranging from 1,875 to 2,020 square feet of living space. These single-family homes have two or three bedrooms, two or two-and-a-half bathrooms and an attached two-car garage. All models offer first-floor master suites and open floor plans. Other great home features include gourmet eat-in kitchens, granite countertops, gas fireplace, spacious master suites, crown molding, vaulted ceilings, and attached back porches perfect for entertaining guests. Homeowners currently pay an annual homeowners' association fee which covers general maintenance of the community grounds as well as lawn care, snow and trash removal. This lifestyle allows homeowners to leave those tedious tasks behind and focus on having fun. Located in Berlin, Connecticut residents of Beckley Farms love the area surrounding the community. Situated near I-91 and Highway 9 residents trying to get to other areas of Connecticut can do so easily. The Brickyard Shopping Center is just a few miles away and offers stores such as Sam's Club and Home Depot. Many medical facilities are within a few miles of the Beckley Farms as well. During the summer months there are countless opportunities for recreation such as golf, fishing, and hiking at one of the local state parks. During the winter months there are also ski resorts in the area for those looking to hit the slopes. Great local amenities along with well designed low-maintenance homes makes Beckley Farms a top choice for active adults Connecticut. Check back soon for more information on the lifestyle in Beckley Farms. Homebuyers can choose between three floor plans ranging from 1,875 to 2,020 square feet of living space. These single-family homes have two or three bedrooms, two or two-and-a-half bathrooms and an attached two-car garage. All models offer first-floor master suites and open floor plans. Other great features include gourmet eat-in kitchens, granite countertops, gas fireplace, spacious master suites, crown molding, vaulted ceilings, and attached back porches perfect for entertaining guests. 55places.com is not affiliated with the developer(s) or homeowners association of Beckley Farms. The information you submit is distributed to a 55places.com Partner Agent, who is a licensed real estate agent. The information regarding Beckley Farms has not been verified or approved by the developer or homeowners association. Please verify all information prior to purchasing. 55places.com is not responsible for any errors regarding the information displayed on this website.